Above: Jackie quad-wields you in the face. My review of The Darkness II is up now at thephoenix.com. Count me among many who were pleasantly surprised by the quality of the story. While the gameplay is a little slicker than before, I don't think it benefits by being more overtly game-like than its predecessor, and by having more traditional level design. In the previous game, Jackie was the only one with magical powers, and his enemies could bring little more to bear than increasingly powerful weaponry. Here, they have enchanted abilities of their own, which may make for a more fair fight, but diminishes a key part of the allure -- the first game was like a monster movie where you got to play the monster. The whole thing is a lot of fun and well worth playing, but after playing the PC version I would certainly recommend that you play on a console. The mouse and keyboard interface is all sorts of messed up. To use the Darkness slash power, you need to click the mouse wheel, and then move the mouse up, down, or to the side to direct it. It doesn't work well, and feels like you're flailing. Plus, you're likely to accidentally scroll and switch weapons. Additionally, when you're wielding two guns, mouse2 fires the lefthand gun, and the mouse1 fires the righthand gun. It feels completely unnatural. Oh, and for some reason you use the N and M keys to swap between skill trees. Makes no sense at all. At any rate, I expected the worst from The Darkness II and found it to be a worthy sequel. This has been a good winter for games, and Syndicate isn't even out yet. What a wonderful time to be alive. The game looks to be very much violent...but still it is very interesting and this game have a perfect gameplay with perfect graphics. Games reviews on the latest video games for PS3, Xbox 360, Wii, PC, 3DS, PSP, and DS. In my point of view The Darkness II good game to play. The action of this game are very nice. 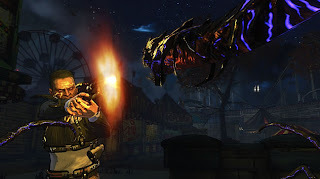 Players can use the different powerful weapons to complete the stages of this game. Really like the art design of the game as it similar to that of the Darkness comic books. Can't want to try it out! I much like game it very fun. Many interesting part with great joy!